According to the data from the Turkish Defense and Aviation Industry Exporters Association (SSI), the sector exports increased from $1 billion 677 million to $1 billion 739 million up 3.7 percent in 2017 over the previous year. The sector featured one of the areas boosting its exports most within last 5 years. 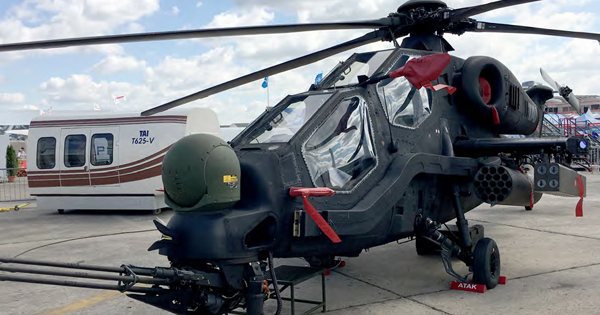 Defense and aviation industry exports raised 38 percent in the years 2012-2017. This performance carried the sector to 5th sector position in the aspect of boosting its exports most in the last 5 years. Ship and yacht industry ranked first regarding boosting its exports 65 percent, olive and olive oil second with 60.6 percent, jewelry third with 59 percent, automotive industry fourth with 49.7 percent. As Turkish defense and aviation industry exporting worth $1 billion 261 million, this rate surged by $1 billion 730 million in 2017. The most exported products were aircraft and helicopter’s parts and components in the defense and aviation sector in 2017. These product exports increased 8.1 percent to $524,4 million in 2017 over the previous year. The parts and components belonging to turbojet and turboprops for the other vehicles increased 7 percent to $276,9 million; the exports for tanks and armored war vehicles increased 17.7 percent to $111,8 million. Worth $77,6 million of single gun barrel without thread, $41,6 million of tank and other armored war vehicles’ parts and components, $36,5 million of other hunt without thread or hunt rifle, $36,5 million of bullets and other ammunition exported last year. Aircrafts and helicopter parts and components took 30 percent share, turbojet and turboprops’ parts and components 16 percent, civil aviation vehicles’ turbojets took 11 percent share in the sector exports. In line with these developments, TAI became the firm achieving the most exports rate of the sector in 2017. TAI was followed by TUSAS Engine Industries Inc., Pratt & Whitney THY Technical Aircraft Engine Maintenance Center Ltd. Co., ASELSAN and Alp Aviation respectively in the exports. In 2016, TAI, TEI, Machinery and Chemical Industry, FNSS, ASELSAN aligned respectively at the list of firms in the exports.